The manager (the person who created the salon) has the right to change all settings of the salon. To access “salon settings” click on salon settings button on the upper right corner as shown below. From “salon settings”, you can update the following items. 1. Global Tags : If you’d like the same set of tags to apply to every media uploaded to a salon, set your global tags from here. For example, if you’d like users to always mark up important things and things to discuss in class, you may choose to include two global tags “important” and “discuss in class”. 2. Related Areas : This describes the relevant areas of the salon. This allows users to find your salon by using key areas. 5. Public/Private : change your salon settings from private to public or vice versa. Private salons can only be accessed by its members and public salons can be viewed by anyone. Some managers keep the salon public until all users have subscribed, and then change to private. This will allow users to immediately enroll w/o waiting for the permission. 6. Show User Engagement Dashboard : The engagement is how actively user participate in salon media by commenting, replying and asking questions. If this option is chosen, user will see how they are doing compared to the median of the class. A graph as shown below will be displayed to each user. The users engagement is measured along 4 important categories: comments, curiosity or questions asked, helpfulness or replies given and consistency (how often you are active). We use colors red (unsatisfactory engagement), yellow (satisfactory) and green (good engagement) to indicate levels of engagement in each category. 7. 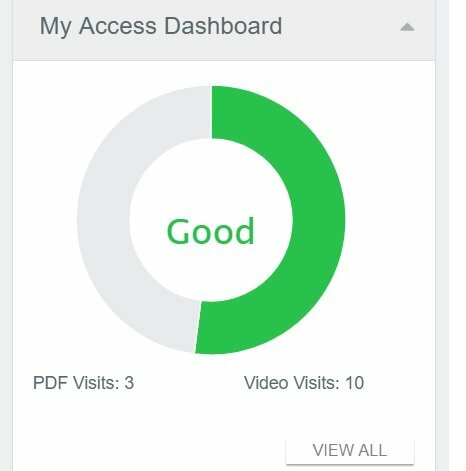 Show User Access Dashboard : In this dashboards users will be shown how they compare to other users in terms of access. That is, how often they visit videos and documents in the salon. The chart will be as shown below. 8. 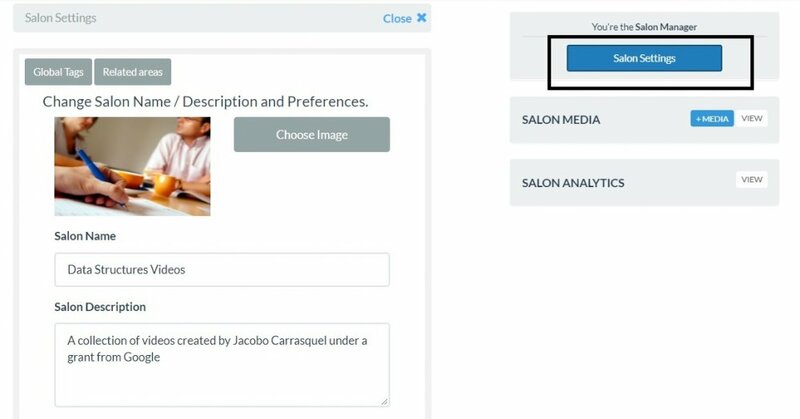 Allow Users to Add Media : By default, any user can add media to a salon. However, if this box is unchecked, users cannot upload media to salon. Only the manager and moderators can upload. 9. Archive Salon : When the salon is no longer in use, the manager can archive. Archive salons do not appear on my salon list. However, manager can un-archive and archived salon anytime. 10. Unsubscribe : We strongly advise managers to “not” unsubscribe. Any unsubscribe salon becomes an orphaned. It is lost forever.